One of the things I love about Melbourne is the fact that you can have a wander down all these laneways in the city and stumble upon something that even locals haven't heard about. During one of my ramblings, I came across the Craft Victoria store at 31 Flinders Lane, Melbourne (at the east end of the CBD, in between Spring and Exhibition Streets). This is one of those collective retail stores, who sell goods produced by a whole bunch of Victorian craft workers and artists. The little retail store contains a cornucopia of little trinkets and treasures; while most items are clearly "chick things" like earrings and jewellery, there are sculptures, the occasional cufflinks, and more importantly for me, unique handmade pieces of tableware. I fell in love immediately with the Gelato range of little cups, bowls and saucers handmade by Jill Symes, which had literally just arrived in-store earlier that week. Now Jill isn't some backyard artist who is just doing this to earn some pocket money - she has completed commissions for the likes of Crown Towers Hotel in Melbourne and the Pinnacle Apartments in Sydney, she has designed and made tableware for restaurants and cafes, and has been in the trade for over 30 years. Just google "Jill Symes Pottery" and you'll get an entire page of relevant hits. Imagine having the creations of a master artist in your house, not just for display, but to serve up stuff to my guests as well! 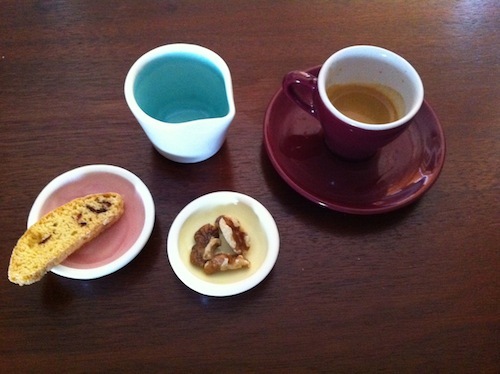 Here is my little collection of pieces from Jill Symes (each signed at the bottom), which I have earmarked to go with my coffee (I must confess that the espresso cup and saucer are Ikea) - a little milk jug, a biscotti from Phillipa's and walnuts from Coles. The coffee was a single estate Kenyan from St Ali. Not cheap at $10-26 per piece, but worth every cent. What struck me at first sight were the soft pastel colours glazed on the inside of each piece - eye candy indeed. Next time you're in Melbourne, spoil yourself and buy some art for your kitchen!